We offer a full menu dining in, for carry out or all night in our basement bar. For gluten free options, please download our Menu. Bottomless, freshly made in house corn tortilla chips served with green tomatillo salsa and red salsa. Tasty nachos covered with queso topped with beans, pico de gallo, crema and guacamole. (Think 8 layer dip) Black beans, rice, pico de gallo, crema, guacamole and your choice of meat. Served with chips. (Made to share) Mound of sweet potato fries covered in warm enchilada sauce, melted oaxaca cheese, black beans, and pico. Topped with guacamole, crema, chipotle mayo with a rim of habanero sauce. Has it all! Rice covered with black beans, oaxaca cheese, pico de gallo, lettuce, crema, chipotle mayo and guacamole served with your choice of meat. An in house favorite. 3 Corn tortillas with a layer of rice and red salsa, covered with melted oaxaca cheese. Topped with onion, cilantro chicken and guacamole. Choice of meat in two enchiladas, topped with either green sweet & spicy tomatillo sauce, or traditional red enchilada sauce. Topped with melted cheese, crema, guacamole, pico. Served with a side of rice and black beans. Fried corn tostada shell covered with black beans, chile sauce, melted oaxaca cheese, lettuce, pico, guacamole, crema and your choice of meat. Topped with cotija cheese served with a side of rice. Fried flour tortilla bowl, filled with rice black beans, cheese, iceburg lettuce and your choice of meat. Topped with pico de gallo, sliced avocado, crema, and your choice of red or green salsa. 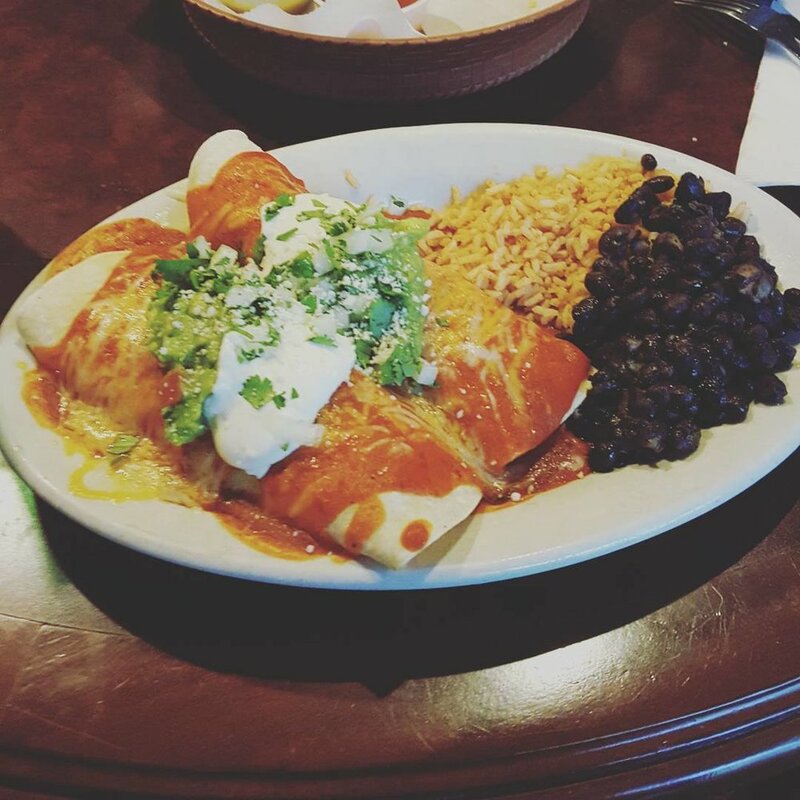 Enchiladas topped with traditional red sauce served with a side of rice and black beans. Stuffed with black beans, rice, onions, cilantro, lettuce, oaxaca cheese, crema, salsa and choice of meat. Huge! Loosen your belt! Stuffed with black beans, rice, onions, cilantro, lettuce, crema, cheese and your choice of meat and salsa. Smothered in warm chile sauce, topped with crema and guac. Burrito filled with savory chicken, black beans, rice, onion, cilantro, lettuce, cheese and Uly's warm enchilada sauce, and choice of salsa. Things could get a bit messy!! It's nacho fault... Burrito stuffed with rice, black beans, oaxaca cheese, crema, onions, cilantro, with your choice of meat and salsa. Topped with our hot queso and served with a small side of chips to help clean up the mess. Add: Pineapple, crema, lettuce, chipotle mayo, queso sauce, or chili sauce for 75¢ ea. Add: Guac, sweet potato fries, french fries, pollo, al pastor, adobada, carnitas for 1.5 ea. Burrito filled with your choice of black or pinto beans, oaxaca cheese, onion, cilantro and your choice of salsa. A California style staple. Packed with black beans, lettuce, onion, cilantro, savory french fries, cheese, crema, guacamole, your choice of meat and salsa. Local invention. Packed with black beans, lettuce, onion, cilantro, cheese, crema, both sweet potato fries and savory french fries, your choice of meat and salsa. Stuffed with Al pastor, sweet potato fries, pineapple, onion, cilantro, black beans, lettuce, cheese, crema, and salsa. Pollo Taco and Al Pastor Taco topped with cotija cheese, served with a side of rice and black beans. All items are served a la carte. "Make it a plate" by adding rice and beans on the side for $3. One taco with two corn tortillas topped with onion, cilantro, and your choice of: Pollo, Carnitas, Adobada, Al Pastor or Black beans. Add cheese and/or crema for 25¢ ea. Dangerously good! Made to order. Fried burrito stuffed with rice, black beans, cheese, onions, cilantro, and your choice of meat. Topped with crema, guacamole, onions, cilantro, and cotija cheese. Five cheese deep dish quesadilla crisped to perfection. Filled with black beans, onions, cilantro and your choice of meat. Served with a side of crema and pico. Fan favorite. Flavorful deep dish five cheese quesadilla filled with chicken, black beans, onion, cilantro and chipotle mayo. Served with a side of crema. This quesadilla with a layer of rice spread throughout. Filled with adobada pork, pineapple, black beans, onions and cilantro. Served with a side of crema. Mozzarella cheese quesadilla filled with alfredo sauce, chicken, roma tomato, onion, cilantro and black beans. Served with a side of crema. When in Rome. Add meat for 1.50 / Add pinto beans and crema on side for 50¢. Corn tortilla topped with chicken, rice, melted cheese, onion, cilantro, red salsa and served with a side of guacamole. Small serving of pinto beans, rice and cheese. 3 Small chicken tacos with cheese. Choice of meat, pinto beans, rice and cheese in a flour tortilla. *Uly's Menu differs for our Eugene taco cart location.